This picture gallery is for one of our bathroom refurbishments. This picture gallery is for one of our garage conversions. This picture gallery is for one of our lounge conversions. 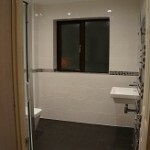 This picture gallery is for one of our toilet refurbishment.